If you’ve been itching for a fix of classic, two-dimensional demon-hunting, then you’re in luck. Konami has just announced that a playable demo of Castlevania: Lords of Shadow – Mirror of Fate will hit the North American Nintendo 3DS e-Shop on February 28, giving handheld gamers a chance to work on their whip technique before the full game launches on March 5. Furthermore, it was also mentioned that digital connoisseurs will have the opportunity to download the full version of Castlevania: Lords of Shadow – Mirror of Fate on its launch date, if they so wish. That can be accomplished by visiting the very same e-Shop. Konami Digital Entertainment, Inc. today announced a playable demo for Castlevania: Lords of Shadow – Mirror of Fate will be available on the Nintendo 3DS™ system via download in the Nintendo eShop February 28. The full game will also be available for download via the Nintendo eShop on launch day, March 5. The free demo will showcase intense whip combat, deep platforming, exploration and spectacular visuals of the highly anticipated title. Players control Trevor Belmont as he takes down the various creatures and minions of Dracula’s fortress. Gamers can also master the combat cross, deal damage with the boomerang, collect hearts and knight scrolls, and face off against the mighty executioner in a battle to the death. Developed by Mercury Steam, Castlevania: Lords of Shadow – Mirror of Fate takes place 25 years after the events of Castlevania: Lords of Shadow, and is a precursor to the highly anticipated and recently announced Castlevania: Lords of Shadow 2 for the PlayStation®3 computer entertainment system, Xbox 360® video game and entertainment system from Microsoft, and Windows PC. Castlevania: Lords of Shadow – Mirror of Fate reveals the story of Gabriel Belmont’s descendants, Simon and Trevor Belmont, as they battle their own destiny only to discover their true, shocking fate. 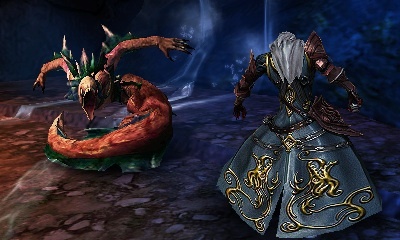 The Castlevania: Lords of Shadow – Mirror of Fate demo will be available via download in the Nintendo eShop February 28. The full game will also be available for download via Nintendo eShop and through retailers on launch day, March 5.